We celebrated 25 years of accomplishments at the AECP 25th Anniversary Gala on Saturday, November 18, while also honoring our Founder Dr. Roger Ohanesian. 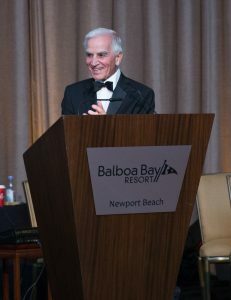 As nearly 300 guests arrived at the Balboa Bay Resort in Newport Beach, they were greeted with background music by Robert Duquenel on the piano along with passed hors d’oeuvres and wine. During cocktail hour, as guests socialized and enjoyed the company of old friends and new, they were entertained by roving magicians and jugglers and had their handwriting analyzed or their futures predicted by a psychic. 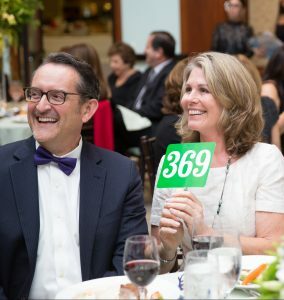 While circulating among friends guests bid on Silent Auction items, which included everything from jewelry and art to dinners and weekend get-a-ways. 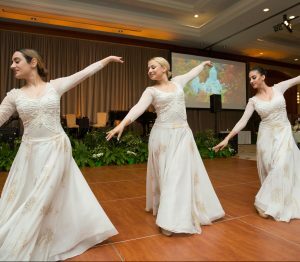 As guests entered the Grand Ballroom and prepared for dinner they were transported to Armenia with 16-foot images of the beautiful country projected onto the walls of the Ballroom and large trees surrounding the perimeter with beautiful green and white floral arrangements throughout. 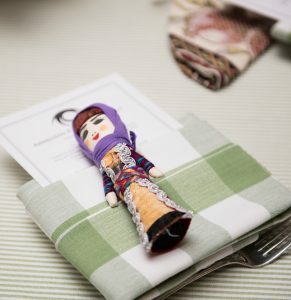 And as an extra touch of Armenia, each place at the dinner tables had a small favor for guests brought from Armenia — traditional Armenian dolls for the women and wine sleeves for the men — as a “thank you” for the long-time support of EyeCare Project donors. As dinner began, Master of Ceremonies, Dr. John Hovanesian, welcomed everyone and thanked them for attending and supporting the EyeCare Project. The delicious five-course Armenian-inspired dinner began with a great Mezze spread, included a savory steak as the main course and ended with a wonderful Chocolate Trilogy of dark and white chocolate mousse. First on the program was a fun “Roast” of Roger Ohanesian by his friends and colleagues. Dr. Diana Kersten, who works alongside Dr. Ohanesian at Harvard Eye Associates in Laguna Hills, told some humorous antidotes. Nune Yeghiazaryan, AECP’s In-Country Director in Armenia, traveled the long distance from Armenia to attend the Gala and delivered a heartwarming message to Roger from the Project’s staff in Yerevan. Yeghiazaryan recalled the circumstances of Ohanesian’s first trip to Armenia, which the ophthalmologist took in 1992, after receiving a fax from the country’s Minister of Health explaining the dire situation in the country — an ongoing war with Azerbaijan, repercussions from a devastating earthquake and the collapse of the Soviet Union — and asking for medical help. 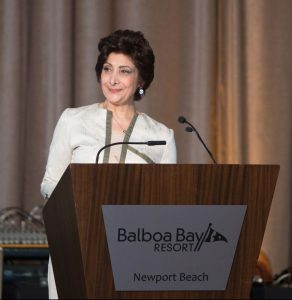 “What was initially meant to be a one-time visit as a response to the emergency in Armenia became the beginning of something much bigger and long-lasting with Dr. Ohanesian returning to America and founding the Armenian EyeCare Project,” said Yeghiazaryan. In accepting his award for 25 Years of Dedicated Service to Armenia Dr. Ohanesian focused on the people who made his vision possible — the physicians who have dedicated their time and the donors who have shared their funds. Following Dr. Ohanesian was a spirited Live Auction conducted by Zack Krone with guests winning items like a beautiful custom-made diamond and sapphire ring, a first-class trip to Armenia and more. Also featured in the program was a beautiful Armenian dance performance by Artur Aleksanyan and his Dance Troupe as well as live Armenian music by Tom Bozigian and his Armenian Band. The Anniversary Gala was the culmination of 25 years of accomplishments in the delivery of eye care in Armenia and the restoration of sight to thousands of Armenians. We also premiered a beautiful video, produced by Art Simon, which told the stories of patients in their own words and moved many in the audience to tears. Throughout our 25th year we’ve celebrated with a number of activities including an unforgettable 25th Anniversary Trip to Armenia in July. More than 25 donors traveled to Armenia to experience the country’s wonderful culture, spectacular landscapes and historical architecture. At the same time they were able to visit the AECP’s patient care facilities in Yerevan and throughout the country and learn how our organization provides eye care to those in need. Donors had the opportunity to participate in the Grand Opening of the AECP Kapan Regional Eye Clinic located in Kapan, Syunik. 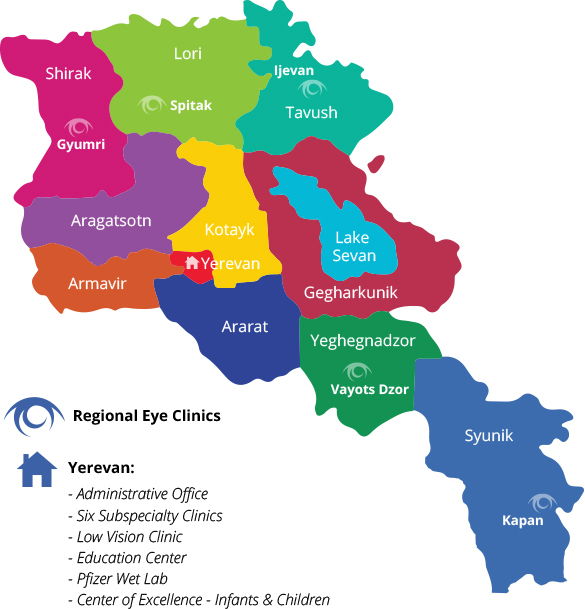 The Kapan Clinic is our third Regional Eye Clinic to open in Armenia as part of our “Five-for-Five” Campaign. In 2017, we also launched a new Diabetes Program in partnership with the World Diabetes Foundation. The country-wide program will screen and take photographs of the retinas of all those in Armenia with diabetes and intervene with treatment when necessary to keep the disease from progressing and avoid the loss of sight. Funds raised at the Gala will support all of our sight-saving programs in Armenia including the Regional Eye Clinics, the Mobile Eye Hospital, the Center of Excellence for the Prevention of Childhood Blindness and the new Diabetes Program to realize our vision for Armenia — a country where no individual is without access to quality eye care; where Armenian ophthalmologists are trained to diagnose and treat eye disease at the highest level; and where preventable causes of blindness are eliminated through an emphasis on prevention and early intervention. As the evening came to a close John Hovanesian thanked everyone for their generous and long-time support saying that the Project could not have made the significant advancements they have without the help of their donors and so many others. We have done some amazing things together over the past 25 years restoring the sight and changing the lives of thousands of Armenians forever.